Smoke from the latest explosion at the Chevron Refinery in Richmond seeps into the atmosphere causing health issues and destroying crops. 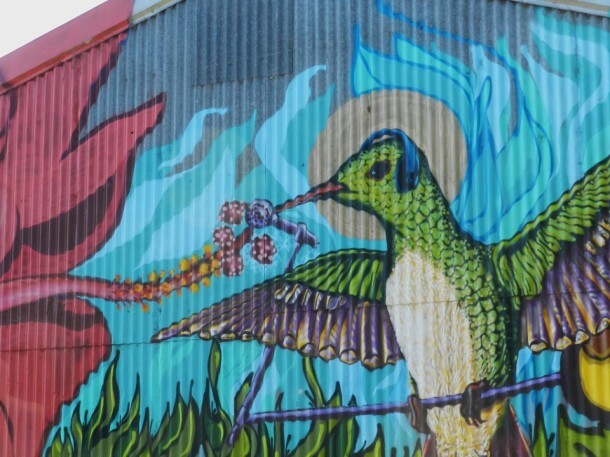 (Richmond, CA) For the past few weeks, the Community Rejuvenation Project has been hard at work at the Greenway in Richmond, part of a collaborative effort with Urban Tilth and the City of Richmond. In addition to the planting of new gardens and the creation of artcrafted benches, the project includes new murals highlighting eco-friendly themes, such as an emphasis on alternate transportation and less dependence on fossil fuels; and more plants, producing more oxygen and improving air quality. The goal of the project is to make the Greenway a more attractive and usable space for pedestrians, cyclists, and community residents. On August 6, a massive fire broke out at the nearby Chevron refinery, resulting in an ominous cloud of black smoke blanketing the city and spewing tons of pollution into the air. Five Chevron employees reported injuries from the 600-degree, highly-flammable mixture of ethanol, freon and benzene released into the atmosphere. Though the fire was contained relatively quickly, its impact was devastating: In the aftermath of the fire, more than 5,000 local residents were admitted to local emergency rooms, many complaining of respiratory problems, migraine headaches, watery eyes, or skin rashes. Gas prices jumped 5 cents per gallon overnight and had risen by 30 cents per gallon a week after the incident. Sadly, Urban Tilth’s gardens were contaminated, forcing hundreds of pounds of organic produce to be thrown away due to safety concerns. Richmond youth put the final touches on the “Food is Medicine” mural in Berryland, a grove of medicinal plants and berries at 6th and the Greenway. Photo by Daud Abdullah. 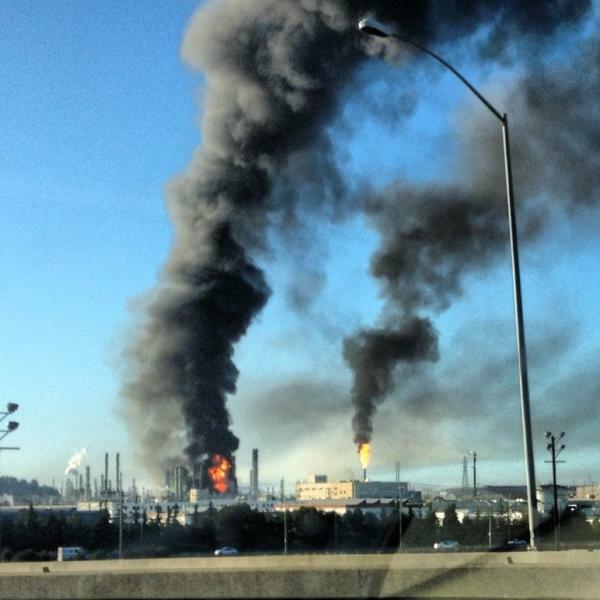 In the days which followed, thousands of Richmond residents filed claims against the multinational company headquartered in Richmond, while newspaper reports detailed the grave context behind the refinery fire: According to the Contra Costa Times, Chevron’s Richmond refinery has had eight major pollution incidents – five of them fires – since 1999. Additionally, the paper reported that “Chevron racked up the highest number of Level 3 accidents — those with a fatality, serious injury and major damage” of the four local refineries during that period, as well as a disparate number of people requiring medical attention or hospitalization. But that’s just the tip of the iceberg: As reported in the San Francisco Chronicle, in 2010, Chevron was responsible for releasing more than 80 % of the cancer-causing agents in Contra Costa County; more than one-third of all children in Richmond have asthma, by far the highest figure in the Bay Area. In the wake of this latest refinery incident, while community advocates and eco-activists have called for increased regulation of toxic emissions and more accountability from Chevron, there is also a need for greater environmental awareness among citizens, whose energy consumption patterns have led to an unhealthy dependence on fossil fuels. CRP’s work in Richmond and West Oakland – which, along with San Francisco’s Bayview-Hunters Point, make up the “toxic triangle,” the inner-city communities facing the worst environmental injustices in the Bay Area – has given the organization a ground-level view of both the problem and possible solutions. As a pavement to policy organization, we advocate for sensible urban policy which results in sustainable, holistic outcomes. We believe environmental reforms are more effective in conjunction with collaborative community-based projects involving a public art component, as part of a coordinated public awareness campaign. 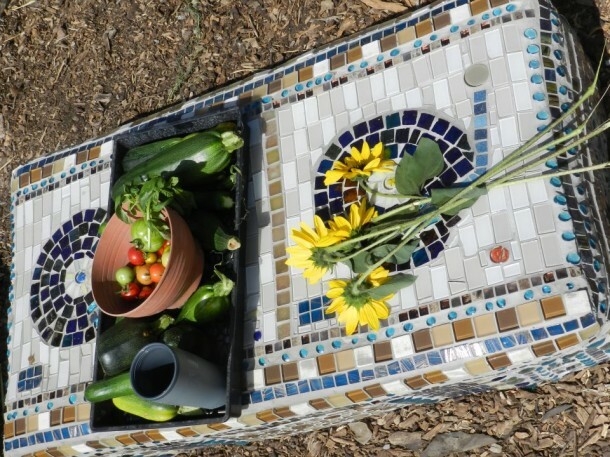 CRP artist Daud Abdullah’s mosaic benches have created a gathering space for people eat healthy food picked straight from the gardens. Photo by Daud Abdullah. 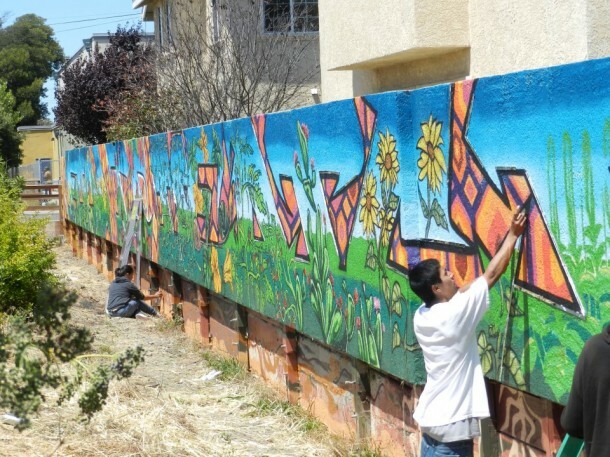 For example, CRP’s “Healthy Living” initiative, which includes the Greenway project, has helped to promote food consciousness, environmental awareness, blight reduction, alternative transportation, cultural pride, youth development, and nonviolence while transforming blighted areas and underutilized spaces in Richmond and Oakland. It’s also helped to highlight the efforts of our community partners like Urban Tilth, Richmond Spokes and Peoples Grocery, who have been on the frontlines of the Bay Area’s burgeoning eco-sustainability and food justice movements. If history is any guide, we haven’t seen the last Richmond refinery fire. Though Chevron has promised an increased commitment to green and sustainable practices, it and other multinational energy companies still have a long way to go. That’s why developing alternatives to fossil fuel consumption, increasing environmental awareness and strengthening the individual health of all our citizens is the direction we need to take if we are to build healthy communities.